¹”Anonanona” is a variant of “nonanona,” meaning ant. Question put out to the public, 1843. Here me O People of Hawaii nei; what do you all think of this cession of the kingdom? Is it fine? Your heart probably aches for the king and all the alii; That is how it should be; we are all hurting; however, do not grieve, do not revolt, do not let your resolve waver. We must remain calm and abide by the laws; don’t think that the laws have fallen, not at all, they are still totally in effect. 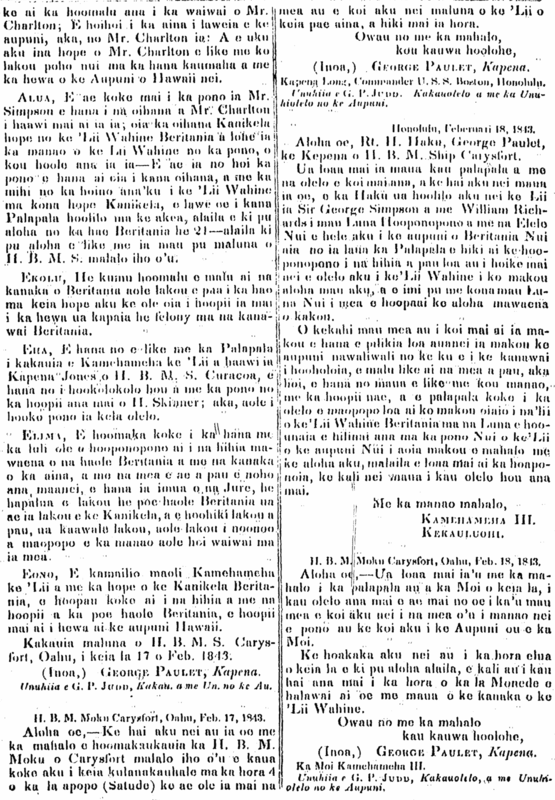 There was a small disturbance in Honolulu the other night, and some men severely injured some of the sailors from the warship, and therefore the laws are being announced once again these days, so that the confusion of the people will end. 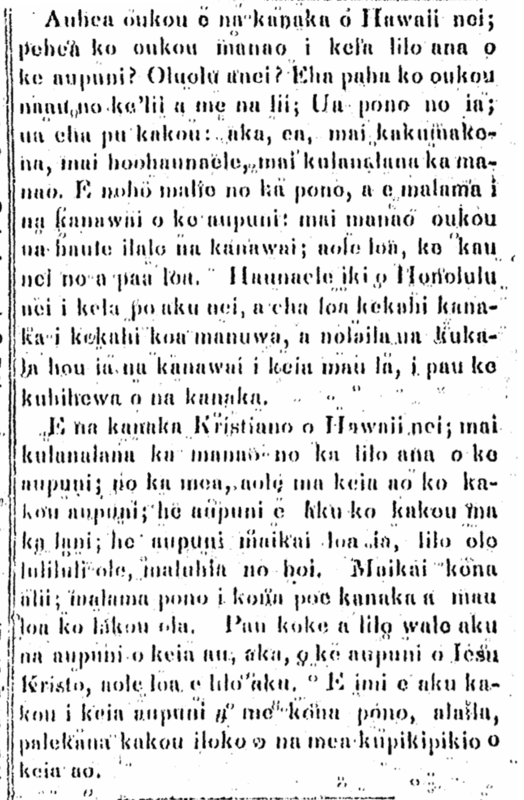 O Christian people of Hawaii nei, do not feel uncertain over the cession of the nation; our kingdom does not lie in this world, we have a different kingdom in the heavens; it is a great kingdom which is permanent, and unshakeable, and peaceful. Its king is good; he watches over his people, and they live forever. The nations of this world end quickly and are gone forever, but the kingdom of Jesus Christ will never end. Let us search after this kingdom and its righteousness, and we will be saved from the turbulence of this world. Ka Nonanona, Buke 2, Pepa 20, Aoao 100. Maraki 7, 1843. 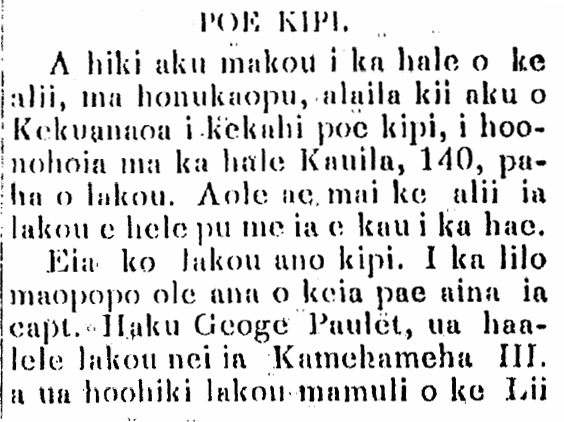 Correspondences between Paulet and the Hawaiian Government. 1843. ON THE LOSS OF THE KINGDOM. Here are the documents illuminating how the Kingdom was lost to the Queen of Britain. The 25th of February was the day the cession was proclaimed. 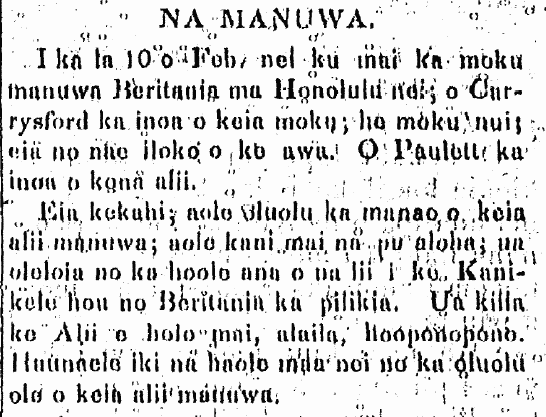 Ka Nonanona, Buke 2, Pepa 20, Aoao 97. Maraki 7, 1843. 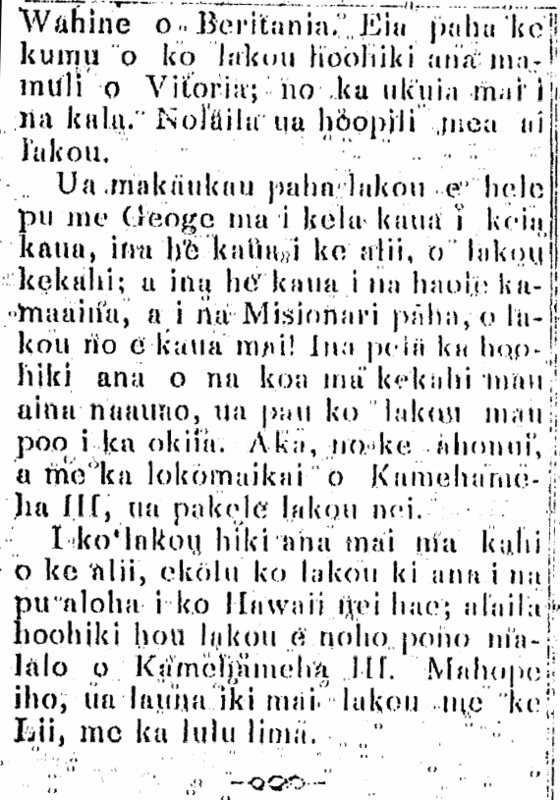 Ka Nonanona, Buke 2, Pepa 20, Aoao 98. Maraki 7, 1843. Ka Nonanona, Buke 2, Pepa 20, Aoao 99. Maraki 7, 1843. On the 10th of this Feb., the British man-of-war arrived here in Honolulu; the name of the ship is Carysfort; it is a large ship and yet is here in the harbor. Paulet is the name of its captain. Here is another thing; the captain of this warship is not here with good intent; he did not fire his guns in salute; it is said that the problem is because of the denial of the new British Consul by the king. The King was sent for to come, and then they’d work it out. The haole here are having minor demonstrations in response to the ill will of the warship captain. 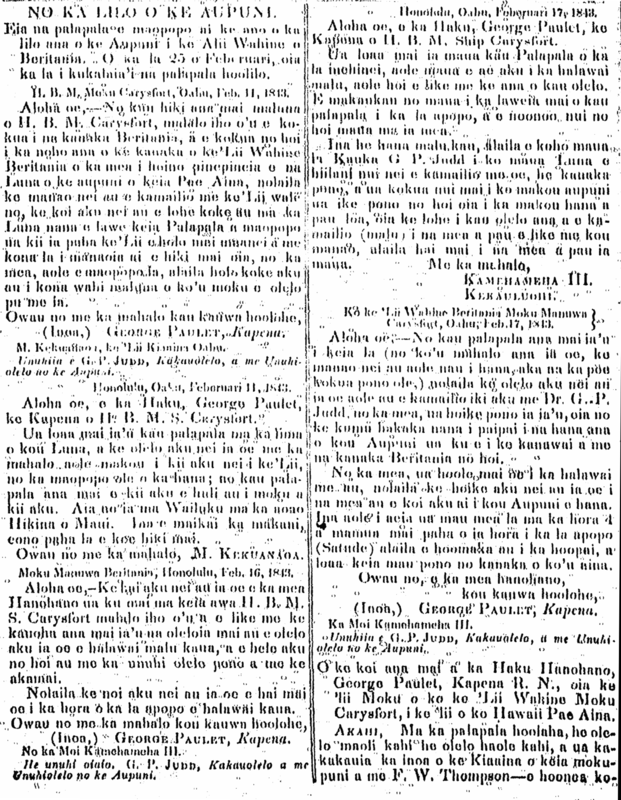 Ka Nonanona, Buke 2, Pepa 19, Aoao 96. Feberuari 14, 1843. DAY NOT TO BE FORGOTTEN BY TRUE HAWAIIANS. 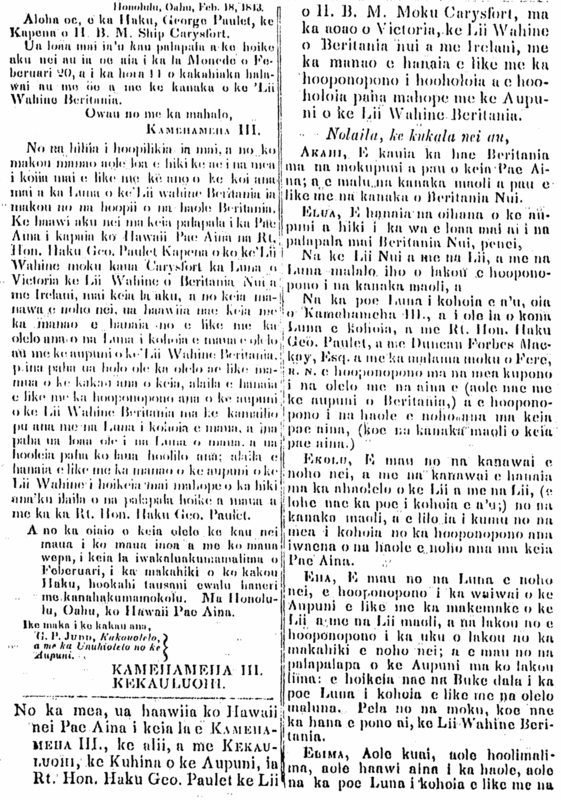 The past 31st of July was a great day celebrated in days of the monarchs, from Kamehameha III all the way until the end of the monarchy; on this day sovereignty was restored and the Hawaiian Flag was raised at that famous park, “Thomas Square,” by Admiral Thomas [Adimarala Tomas], who did the restoration, being that on the 25th of February, 1843, the British Flag was raised over the Fort of Honolulu. As a result of the threats by Lord George Paulet; Britain’s high officer on the Pacific Ocean, it was Admiral Thomas who restored the sovereignty of the land, and re-raised the Hawaiian Flag on the flag staffs at the Palace (Iolani) and the fort of Kaleiopapa Kauikeaouli Kamehameha III, the king of Hawaii at the time; Aloha to Hawaii of old, which is the Territory of Hawaii now. 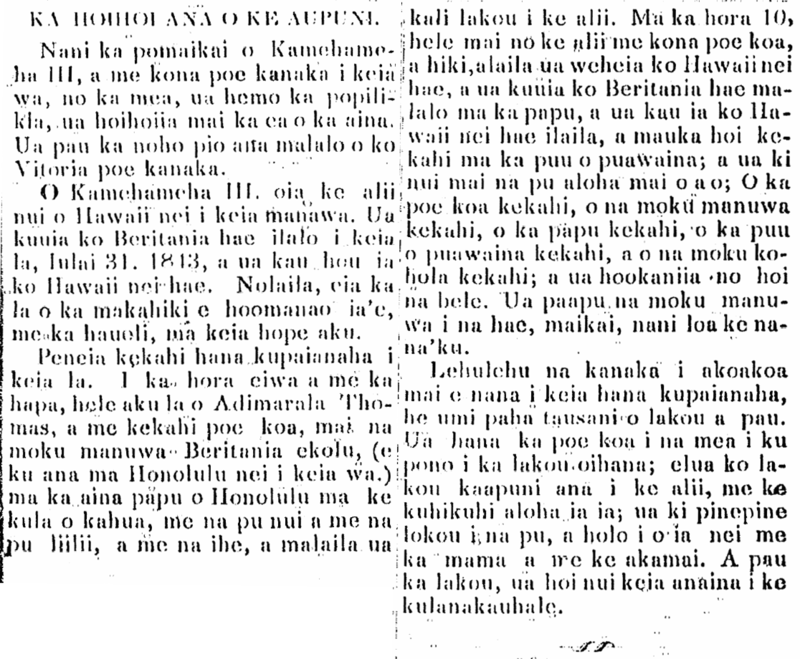 Kuokoa Home Rula, Buke X, Helu 31, Aoao 1. Augate 1, 1912.